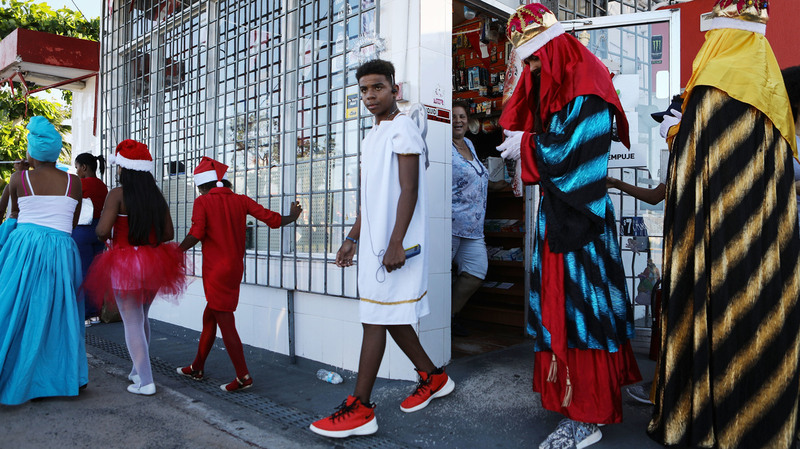 New Three Kings Day Traditions Form In The Aftermath Of Hurricane Maria : The Record Three Kings Day is the highlight of the holiday schedule for most in Puerto Rico. But after Hurricane Maria, the sound of season is changing. On Sept. 20, Hurricane Maria devastated Puerto Rico, initially wiping out electricity and cellular reception on the entire island and causing billions of dollars in structural damage. Nearly four months later, much of the island still has no power and there are debates over the official death toll. Although the island officially reopened its doors to tourism last month, locals and natives note that the Christmas holiday was understandably scaled back compared to years past. "In my town, this Christmas has been way understated because there's many parts that still have no electricity," says Luis Miranda Jr., a native of Vega Alta. "So it's difficult to even put a Christmas tree up with some lights." But while Christmas was subdued, morale on the island is being re-energized by this weekend's upcoming celebration of Three Kings Day. As one of the most important dates on the Puerto Rican calendar, the Jan. 6 holiday commemorates the arrival of the biblical three kings, also known as the three wise men or the magi, and their adoration of the baby Jesus. In many Spanish-speaking countries, the holiday is marked with festivals, processions and presents for children. Miranda has memories of singing, dancing and chasing chickens for the holiday meal at his grandfather's house in Maricao. "It was the holiday," Miranda explains. "There is always live music. We celebrate it with music and food — those were two important ingredients. Presents were important and we all got presents, but the celebrations' main items were music and food." Usual traditions on the island include a celebration at Luis Muñoz Marín Park in San Juan and large processions in Juana Diaz, the unofficial hometown of the magi. (The tourism offices of these respective cities could not be reached to confirm if their annual events were taking place this year.) The department store chain Macy's is still planning to hold celebrations in both their Ponce and San Juan stores this week. "Guests will enjoy live holiday music from local group Plenativa, arts and crafts [and] special gifts," Jacqueline King, Macy's Inc Media Manager says. "Plus, guests will be able to snap a photo with the three kings themselves with their personal camera." But with the past few months being anything but usual for Puerto Ricans, new traditions are forming as well. Luis Miranda, Jr. and with his son, the Tony Award-winning Hamilton creator and star Lin-Manuel Miranda, have partnered with Toys 'R' Us and Telemundo, to orchestrate 40 toy drive events in the last month. The Mirandas' "Toys 4 Puerto Rico" drive will distribute the nearly 40,000 collected toys across the island this weekend, while four events take place in the U.S. where Puerto Ricans have migrated (New York, Philadelphia, Orlando and Chicago). Luis Miranda, Jr. is employing out-of-work musicians on the island, from plenero bands to singing theater troupes, to act as the day's entertainment. "They will get paid to perform when they have not been able to because of the economic situation in the island," Miranda says. To hire the talent, Miranda enlisted the help of R.Evolucion Latina, an arts and community outreach organization based in NYC but working extensively on the island. Luis Salgado, founder and director of the organization, says there are performances planned in every corner of the island, from San Juan to Vega Alta to Dorado, with "a big spectrum of different artists." One of those artists is Yari Helfeld. R.Evolucion Latina has been working with Helfeld's performance group Y No Habia Luz since the hurricane hit in September and has hired them for this weekend's events. "It's super useful to help people start opening their feelings because now people are super tense and anxious," Helfeld says. "We don't know how to escape, to relax the feelings the catastrophe created in us. So, through the music, we start to 'dejando,' let it go." R.Evolucion Latina and the Mirandas aim to not only unite the island with music this holiday, but set up a six-month work calendar for those still on the island — a new "normal" for Puerto Rico's musicians, Salgado says. "Once the parrandas season is over, a lot of those musicians are also looking for work," he explains. "We're trying to activate them in social ways where they continue to visit different towns and continue to uplift the moral necessities and the psychological necessities that people are going to are facing due to the circumstances."